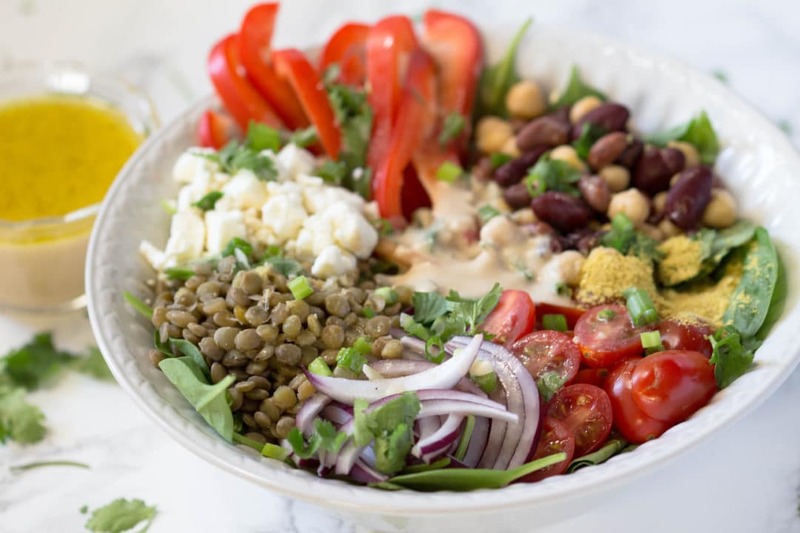 This plant protein bowl is loaded with protein, antioxidants and nutrients to fuel you up all day! If you know me at all, I always grab a bowl instead of eating off a plate. I just like mixing it all up in a bowl and grubbing!! Everything slides around on the plate and it’s hard to mix together – right?! Besides this plant protein bowl tasting ultra delicious…the bowl part is what I love most! OK…I think you all get it now that I like bowls – haha! 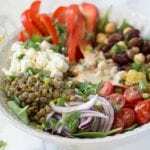 How do you all incorporate plant proteins into your diet? Try out this bowl for a quick weeknight dinner or prep it ahead and have it for lunch! Arrange all ingredients in a bowl in sections. I placed a dollop of the tahini in the middle of my bowl too. For the dressing, simply whisk all ingredients together! Voila!